Jesus taught it is not physical food that truly gives life to our body, but it is to partake of the knowledge of him who is the bread of life. It is the hidden man of the heart that is important to God. Jesus taught a person is defiled not by the food eaten which the body purges, but what a person speaks is what is able to defile him. (Mark 7:14-23). And when he had called all the people unto him, he said unto them, Hearken unto me every one of you, and understand:There is nothing from without a man, that entering into him can defile him: but the things which come out of him, those are they that defile the man. If any man have ears to hear, let him hear.And when he was entered into the house from the people, his disciples asked him concerning the parable.And he saith unto them, Are ye so without understanding also? Do ye not perceive, that whatsoever thing from without entereth into the man, it cannot defile him; Because it entereth not into his heart, but into the belly, and goeth out into the draught, purging all meats? And he said, That which cometh out of the man, that defileth the man. For from within, out of the heart of men, proceed evil thoughts, adulteries, fornications, murders, Thefts, covetousness, wickedness, deceit, lasciviousness, an evil eye, blasphemy, pride, foolishness:All these evil things come from within, and defile the man. When the disciples noticed Jesus had nothing to eat and should be brought some food it is then Jesus reveals the true meat worth eating and which would sustain a person if done. (John 4:31-34). In the mean while his disciples prayed him, saying, Master, eat. 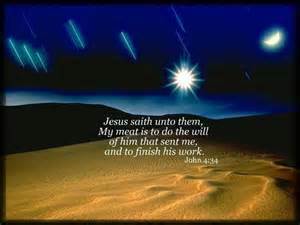 But he said unto them, I have meat to eat that ye know not of.Therefore said the disciples one to another, Hath any man brought him ought to eat?Jesus saith unto them, My meat is to do the will of him that sent me, and to finish his work. God sent angels food in the wilderness called manna, and revelation tells us to those who do Gods will and overcome will receive hidden manna which only the one who receives it will understand as it is from God alone. (Revelation 2:17). He that hath an ear, let him hear what the Spirit saith unto the churches; To him that overcometh will I give to eat of the hidden manna, and will give him a white stone, and in the stone a new name written, which no man knoweth saving he that receiveth it.